The Smartphone is an amazing tool; all you need to do is download an app to get things like the latest weather report sent directly to your phone. In fact, thanks to Hyundai’s Android Auto™, you can connect your Hyundai to your Smartphone and enjoy some of your favourite apps while driving. 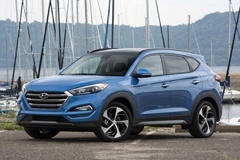 While not available on all models yet, it is available on the All-New 2017 Hyundai Tucson. In addition to the connection to your Smartphone, the Tucson comes with a touch-screen display that projects the view from your standard installed rear view camera. Some packages like the 2.0L Premium, the 1.6T Limited and the 1.6T Ultimate have 8-inch screens with a navigation system for easy-to-read directions and eight speakers rather than six speakers for an enhanced audio experience. iPod®/USB and MP3 input jacks and a Bluetooth® hands-free phone system are standard on all packages. When you get behind the wheel of your Tucson, you want a comfortable fit that makes you feel as if you could drive for days. The multi-adjustable bucket seats make it easy to find the right comfort level. Depending on which trim package you choose, your driver’s seat is either a manual 6-way or a power 8-way adjustable seat. With the 8-way driver’s seat, you get 2-way lumbar support for the greatest support for long trips. Regardless of the model, you get heated seats for those cold mornings, and the 1.6T Ultimate package includes a ventilated front seat. You can fit all of your friends into the Tucson; it seats five with plenty of room for your sporting gear. Should you choose to leave everyone home, you can split the backseat 60/40 to get your golf clubs in or lay the entire back seat down and load up your mountain bike. A Smart Power Liftgate is available on some models for hands-free access to the cargo area. It’s not too soon to start thinking about winter sports, and the All-Wheel-Drive (AWD) option lets you grab hold of those slippery roads, which makes it a great option when heading out to the slopes for a day of skiing. Under normal circumstances, your front wheels get 100 per cent of the torque, but if you get into an icy situation, the AWD will automatically deliver 50 per cent of the power to the rear wheels. To make things even better, you can choose when you want AWD by locking it into place. This offers a split between the front and rear wheels making off-road driving safer. The Tucson also has Active Cornering Control (ACC), which transfers the torque automatically to the wheel getting the most traction for a more controlled turn. You can choose between a 4-cylinder 2.0L GDI engine and a 4-cylinder 1.6L turbo GDI engine. The turbo is a twin-scroll turbocharger designed to deliver a quick response over a maximum output. It all starts with the 2017 Hyundai Tucson’s sleek styling that makes it look like it is ready to pounce onto the road. From the 19-inch or 17-inch alloy wheels to the stylish LED taillight, the Tucson is ready to turn heads. There are eight colours to choose from and seven trim packages. Colours like Sedona Sunset and Caribbean Blue accentuate the sporty lines while showing off the chrome front grille and those highly stylized alloy wheels. Chrome door handles and window belt mouldings add even more flash. To make sure that you can see and be seen, Hyundai equipped all Tucson models with projection headlights with LED accents and LED daytime running lights. The 1.6T Limited offers Dynamic Bending Lights (DBL), which are headlights that rotate and High Intensity Discharge (HID) lights. The 2017 Hyundai Tucson has many other features to offer, so come by and test drive it today.